The holidays are almost here. That means I need to show you my Pumpkin Pie In A Jar recipe. As you’ve come to know, I am all about easy or as easy as possible and this certainly falls in this category. Why do I like things in jars? It is a wonderful way to provide portion control, they’re easy to transport, they make fun gifts, and they’re pretty darn cute. Preheat the oven to 425 degree. From the unbaked pie crusts, cut 6 – 2 ½ x 8 inch strips and 6 – 3 inch circles, line the jars with the strips and then place the circles in the bottom and gently press around the edges of the circle and strip to seal the edges. With a pastry brush, coat the bottom and sides of the crust with butter. Set the prepared jars aside. In a large bowl, mix the pumpkin pie mix, evaporated milk and eggs until combined. Carefully ladle the pumpkin mixture into the 6 prepared crust lined jars. Place on a silpat lined baking sheet. Bake in oven for 15 minutes then reduce the temperature to 350° and continue to bake for 30 to 35 minutes or until knife inserted in the center comes out clean. Cool for 2 hours. Serve immediately or refrigerate up to five days. 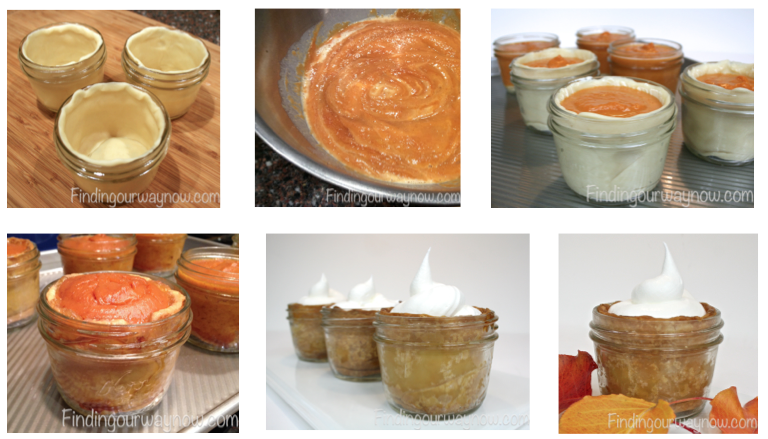 Notes: I tried several different ways to line the jars with the crust. What I described was the easiest way by far. You can also just put the rounds of crusts in the bottom of the jars and not on the side. It works just fine. I used a good quality store bought piecrust to make it easier. If you use cool whip to top the pies it will stay longer and can be piped on the pies ahead of time. 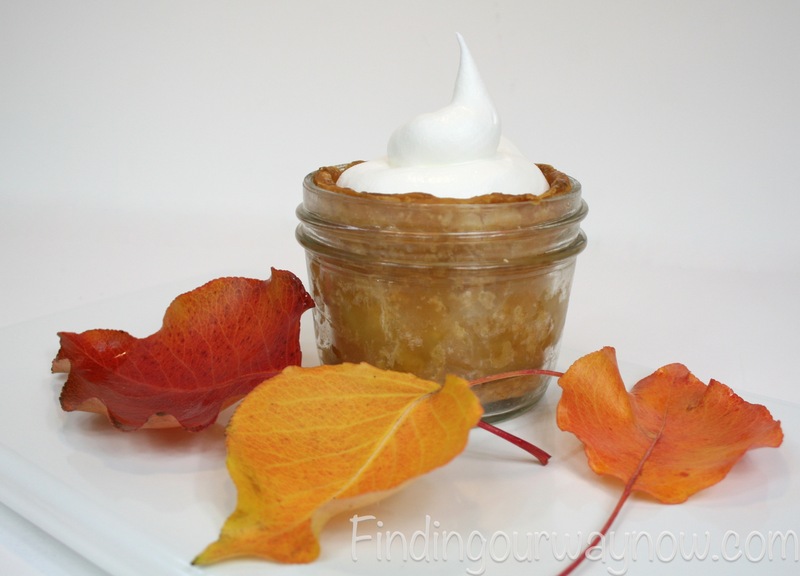 Now isn’t this Pumpkin Pie In A Jar the cutest thing ever? They’re easy to make and fun to serve. The fact that they are as delicious as they are cute is a winning combination in my book. Enjoy. 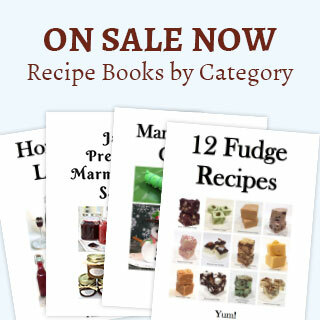 If you enjoyed the Pumpkin Pie In A Jar, check out some of my others such as the Chocolate Mousse Pie In A Jar, Lemon Meringue Pies In A Jar & Macaroni and Cheese In A Jar.